I don’t believe in Astrology but 5th January 2018 is a particularly auspicious and propitious date for a quick jaunt to Mars and back. And billionaire Denis Tito plans to take advantage of the advantageous alignment of Mars and Earth to make the first manned trip to Mars and back. 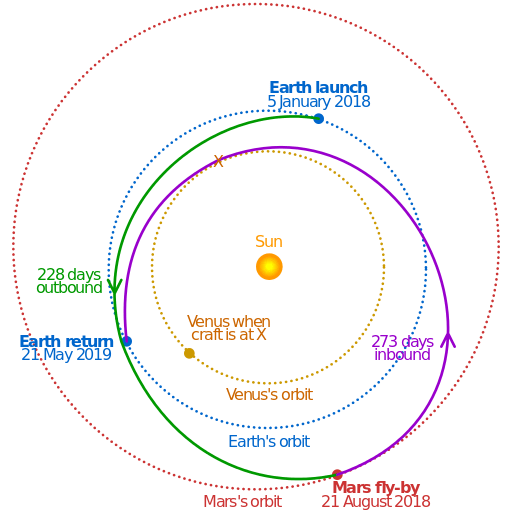 It would be a “free-return” trajectory so the couple making the trip would only fly around Mars and return to a landing on Earth 501 days after they left. InspirationMars: The mission’s target launch date is Jan. 5, 2018. This exceptionally quick, free-return orbit opportunity occurs twice every 15 years. After 2018, the next opportunity won’t occur again until 2031. The mission will provide a platform for unprecedented science, engineering and education opportunities, using state-of-the-art technologies derived from NASA and the International Space Station. It will be financed primarily through philanthropic donations, with some potential support from government sources. woman, to the far side of Mars and return them to Earth. ….. Inspiration Mars’ Architecture Study Report describes the proposed mission architecture to enable the voyage of 314 million miles in 501 days, which requires collaboration through a public-private partnership with NASA. The plan calls for two launches to keep crew and cargo separate, an inherent safety feature to the mission architecture. First, the SLS will lift off from Kennedy Space Center with a four-part payload to place cargo into Earth’s orbit, consisting of: an SLS upper-stage rocket to propel spacecraft from Earth’s orbit to Mars; a service module containing electrical power, propulsion and communication systems; a Cygnus-derived habitat module where the astronauts will live for 501 days; and an Earth Reentry Pod derived from Orion. The second launch will take the crew into orbit aboard a commercial transportation vehicle (selected from competing designs under NASA’s Commercial Crew Program). From there, the crew and Inspiration Mars vehicle stack will rendezvous in orbit using docking procedures perfected by more than 130 trips to the International Space Station. …. Low energy Free Returns with TOFS around 3 years (or less) are plentiful and occur every synodic period. Higher energy Free Returns with TOFS around 2 years are also plentiful and occur synodically. Of particular interest are fast Free Returns which occur in 2015 and 2017 and have the shortest TOF of about 1.4 years. These trajectories may provide a timely opportunity for the first human mission to Mars. A Soyuz capsule carrying three astronauts has docked at the International Space Station, just six hours after blasting off. 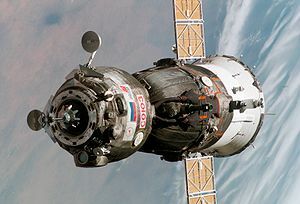 Typically, manned Soyuz flights to the ISS last more than two days. Russian cosmonauts Pavel Vinogradov and Alexander Misurkin and US astronaut Chris Cassidy took the express route to the International Space Station overnight Thursday, docking in the early hours of Friday morning. They will join three other crew members and remain on board for five months. “It’s such a beautiful sight, hard to believe my eyes,” the 59-year-old Vinogradov, making his third visit to space, said in footage broadcast on NASA TV. The International Space Station‘s orbit varies between altitudes of 330 – 410 km and it orbits the Earth about 15 times a day. So a journey taking 6 hours to scale about 70 km of altitude per hour may not seem so impressive compared to the speeds on a German autobahn. But a trip which used to be completed on the 3rd day and 34 orbits after lift-off is going to be covered in 5hrs 49 mins and 4 orbits after launch later today. For its 3-man crew, the Soyuz craft can only carry enough fuel and supplies for at most a 4 day journey, so this fast-track approach will represent a major saving of fuel and supplies. The trio will blast off from the Central Asian spaceport of Baikonur Cosmodrome in Kazakhstan aboard a Russian Soyuz spacecraft. The mission’s Soyuz rocket rolled out to the launch pad on Tuesday (March 26) to prepare for today’s liftoff. In the nearly 13 years since crews first began launching to the International Space Station, it has taken Russian Soyuz capsules and U.S. space shuttles about two days to reach the orbiting lab after liftoff. Now, NASA and Russia’s Federal Space Agency are testing out a new, accelerated schedule. The quick journey, which takes just four orbits of Earth, has been carried out by recent unmanned cargo spacecraft visiting the space station, but never by a crew. Cassidy, Misurkin and Vinogradov are planning to join the station’s Expedition 35 mission for a roughly six-month stay. The current residents of the outpost are commander Chris Hadfield of Canada, Russian cosmonaut Roman Romanenko, and NASA astronaut Tom Marshburn. SpaceX has launched CRS-2 — its second mission to the International Space Station. The Dragon capsule aboard the Falcon 9 rocket will dock with the ISS today, delivering 677 kg of cargo to the astronauts currently there, and will return in about 2 weeks. Initial thruster problems threatened the mission but these seem to have been solved. But vexing trouble with the capsule’s rocket thrusters quickly turned the $133 million flight into a high-tech cliff hanger. Six-and-a-half hours after launch, follwoing extensive troubleshooting and analysis, it appeared company engineers had resolved the problem, bringing all four sets of thrusters on line and setting the stage for a delayed rendezvous with the space station. Hawthorne, Calif. – Today, Space Exploration Technologies (SpaceX) successfully launched its Falcon 9 rocket and Dragon spacecraft to orbit for SpaceX’s second mission under its Commercial Resupply Services (CRS) contract with NASA. Falcon 9 completed its job perfectly, continuing its 100 percent success rate. After Dragon separated from Falcon 9’s second stage approximately nine minutes after launch, a minor issue with some of Dragon’s oxidation tanks was detected. Within a few hours, SpaceX engineers had identified and corrected the issue, normalizing the oxidation pressure and returning operations to normal. Dragon recomputed its ascent profile as it was designed to and is now on its way to the International Space Station (ISS) with possible arrival on Sunday, just one day past the original timeline. Dragon is the only spacecraft in the world today capable of returning significant amounts of cargo to Earth. Dragon will stay on station for a three-week visit, during which astronauts will unload approximately 1,200 pounds of cargo and fill the capsule with return cargo, for return to Earth. Dragon is filled with supplies for the ISS, including critical materials to support science investigations. Later this month, Dragon will return a payload that includes research results, education experiments and space station hardware. Updates on the CRS-2 mission can be found at www.spacex.com/webcast. Broadcast quality video may be downloaded at vimeo.com/spacexlaunch and high-resolution photos are posted at spacexlaunch.zenfolio.com. SpaceX designs, manufactures, and launches the world’s most advanced rockets and spacecraft. The company was founded in 2002 by Elon Musk to revolutionize space transportation, with the ultimate goal of enabling people to live on other planets. Today, SpaceX is advancing the boundaries of space technology through its Falcon launch vehicles and Dragon spacecraft. SpaceX is a private company owned by management and employees, with minority investments from Founders Fund, Draper Fisher Jurvetson, and Valor Equity Partners. The company has more than 3,000 employees in California, Texas, Washington, D.C., and Florida. For more information, visit SpaceX.com. Space Exploration Technologies (SpaceX) made history when its Dragon spacecraft became the first commercial vehicle in history to successfully attach to the International Space Station. Previously only four governments – the United States, Russia, Japan and the European Space Agency – had achieved this challenging technical feat. May 22/Launch Day: SpaceX’s Falcon 9 rocket launched the Dragon spacecraft into orbit from the Cape Canaveral Air Force Station. May 24: Dragon’s sensors and flight systems were subjected to a series of complicated tests to determine if the vehicle was ready to berth with the space station; these tests included maneuvers and systems checks in which the vehicle came within 1.5 miles of the station. May 25 – 31: Astronauts open Dragon’s hatch, unload supplies and fill Dragon with return cargo. May 31: Dragon is detached from the station and returns to Earth, landing in the Pacific, hundreds of miles west of Southern California. Live coverage of the hatch opening, including some of the first video from inside Dragon, will begin Saturday at approximately 3:00 AM PT/ 6:00 AM ET on www.spacex.com . First private space flight to the ISS in November? California-based rocket maker SpaceX said that it will make a test flight in late November to the International Space Station, now that NASA has retired its space shuttle program.The Dragon space capsule to be launched by a Falcon Heavy rocket has been given a November 30th launch date by NASA. The Space X news release is here. The company won $75 million in new seed money earlier this year, after it became the first to successfully send its own space capsule, the gumdrop-shaped Dragon, into orbit and back in December 2010. 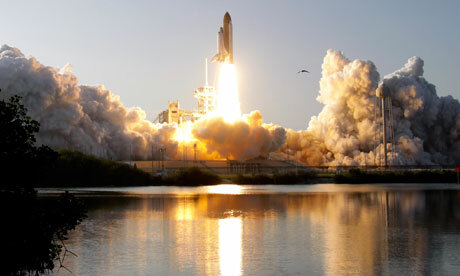 The US shuttle Discovery has launched from the Kennedy Space Center for the last time. The orbiter roared into a bright blue Florida sky, leaving the pad at 1653 local time (2153 GMT). Its 11-day mission will see it deliver a new store room and a sophisticated humanoid robot to the International Space Station (ISS). Only two further flights remain by Endeavour and Atlantis, which Nasa is trying to see concluded this year. The orbiter fleet is then expected to retire to museums. ….. First launched in 1984, this is its 39th outing. When it lands back on Earth in nearly two weeks’ time it will have covered a cumulative career distance of 230 million km (143 million miles). That’s further than the distance from the Earth to the Sun (149 million km). Once the shuttles are retired, the plan is for US astronauts to fly to the space station on Russian Soyuz rockets until perhaps the middle of the decade. Only 3 more flights – money permitting – for an iconic series of space craft before they are retired. The US shuttle Discovery has rolled out for what should be its final mission. The orbiter completed its slow journey to the Kennedy Space Center’s Launch Pad 39A overnight, Monday into Tuesday. Discovery’s flight to the space station is scheduled to begin on 24 February. With its crew of six astronauts, the ship will deliver a storeroom to be attached to the 350km-high platform, along with further supplies and spares. NASA last tried to launch the vehicle in November but technical hitches, including cracks on its giant external fuel tank, kept the ship on the ground. The agency said engineers had now fixed those defects and carried out further work to strengthen the tank. President Barack Obama and the US Congress have determined that the shuttle fleet should be retired this year. Discovery is the oldest of the three surviving orbiters. First launched in 1984, it has since completed 38 missions, travelling some 230 million km in the process. Endeavour is expected to fly to the station in April. Atlantis will go no earlier than June, if Nasa has sufficient money left in its shuttle programme budget. Following the fleet’s retirement, the plan is for US astronauts to fly to the space station on Russian Soyuz rockets until perhaps the middle of the decade. The final mission of the space shuttle Discovery has been postponed again because of a fuel leak. After 26 years of service, the vehicle is due to make one last flight to the International Space Station (ISS) before being retired to a museum. Escaping hydrogen detected midway through fuelling left Nasa no choice but to stand Discovery down once more. The agency is now planning a launch date on 30 November, to give plenty of time to fix the leak. Nasa has simply run out of time in the current launch window, which ends on Monday. There then follows a three-and-a-half-week period of unfavourable sun angles at the orbiting platform that make a docking very difficult because of the heating experienced by an approaching shuttle. The leak occured at the ground umbilical carrier plate, an attachment point between the external tank and a 18cm pipe that carries vented hydrogen safely away from Discovery to a flare stack, where it is burned off. Discovery’s six astronauts had yet to board the spaceplane when the leak was detected. When the ship does get up, she will deliver a storeroom to be attached to the ISS, along with much needed supplies and spares. After Discovery returns, only the Endeavour shuttle has a firm date to launch, in February next year. Atlantis could fly in June if the budget allows. Beyond that, American astronauts will use Russian Soyuz rockets to get into space until a range of commercial US launch systems are introduced in the middle of the decade. 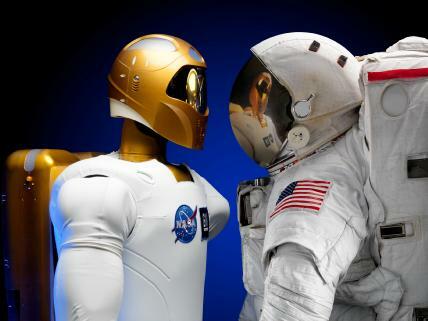 Robonaut 2, a dexterous, humanoid astronaut helper, will fly to the International Space Station aboard space shuttle Discovery on the STS-133 mission. The U.S. National Aeronautics and Space Administration (NASA) Wednesday greenlighted a launch of space shuttle Discovery on Thursday 4th November, to begin its 11-day mission to the International Space Station. The Prelaunch Mission Management Team (MMT) now is confident since a main engine controller problem on Discovery has been solved, said Mike Moses, chairman of the MMT. Therefore, the team gave a unanimous “go” for Discovery’s launch due to start at 3:29 p.m. EDT (1929 GMT) on Thursday. CAPE CANAVERAL, Fla. (AP) — NASA celebrated 10 years of continuous human presence at the International Space Station on Tuesday while readying shuttle Discovery for one last trip into orbit. Lift off is set for Wednesday afternoon. On Tuesday an electrical problem cropped up again aboard space shuttle Discovery and could jeopardize Wednesday’s launch. The trouble appears to be with a backup controller for one of the shuttle’s three main engines. NASA ordered last-minute reviews and hurriedly scheduled a mid-afternoon meeting of top managers. A NASA spokeswoman said it’s too soon to know whether Wednesday afternoon’s planned launch will remain on track. Discovery’s final launch originally was scheduled for Monday, but was delayed by shuttle gas leaks. The controller was sluggish early Tuesday morning. But after turning a circuit breaker and switch on and off several times, everything seemed to be fine. Later, voltage irregularities were noted.